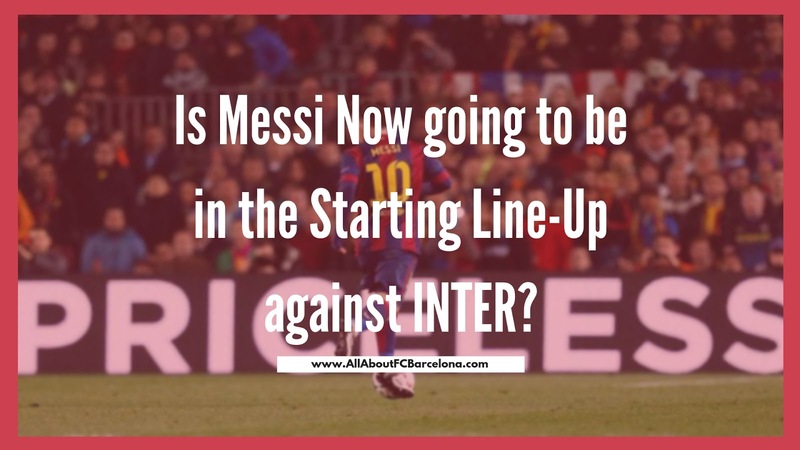 Is Messi Now going to be in the Starting Line-Up against INTER? Lionel Messi surprisingly found himself in the Squad traveling to Milan to face Inter, despite not getting a Medical all-clear. What should fans actually read from his inclusion? Barcelona Football Club surprised everyone in footballing world when they announced the squad which would travel to Milan to face Inter Milan. The surprise was the inclusion of Lionel Messi's name in the travel list. Messi's injury layoff after he fractured his arm against Sevilla has been the biggest talking point so far in footballing World. Now it looks like his come back from injury will be a bigger talking point! As per the initial schedule, Messi was supposed to be available at the earliest in the coming weekend's home match against Real Betis. No one expected him to play that match as an International break was immediately after that. But now all those calculations have been thrown to win with the sudden inclusion of him in the squad traveling to Milan. When Lionel Messi's name was announced in the squad, the initial thoughts were that it was a psychological move to put the opposition at bay; especially when he has not received the all-clear from the Medical team. But soon, that feeling got vanished into thin air. There was no reason for throwing caution to the wind, especially in the Group stage of the Champions League. We do sit pretty comfortable at the top of the table and we did deal with Inter pretty impressively at the Camp Nou without Messi. Even though this is a tough away match, there was nothing in the equation to suggest the need for 'Our Best Player' to deal with it. The team is more than capable to secure at least a point from San Siro. His absence will make the job tough, but not impossible. So what exactly will demand his inclusion? Lionel Messi looks like have Got himself included in the team! It's a known fact that Messi has the last say in deciding whether he plays or not. And it appears that he may have had his way in this also. The best explanation for this strange situation was given by this article - Why Messi is desperate to make Early Comeback?. As mentioned in the article, the Balon d'Or prize could be a crucial factor in getting Lionel Messi up and firing against Inter Milan. If what's written in the article is true, then we most probably will see him starting the game against Inter Milan. I understand that he is not yet declared fit, but in all probability that will be done by tomorrow, before the match. And if he is fit and raring to go, there is no point in having him on the bench. Champions league is one trophy he covets the most this season. So if he is in Milan, he would better play. Definitely there is a fear of him being rushed early from the injury. But we all can reassure ourselves that the club medical team would not have allowed him to travel had he been not fit enough. The very fact that he is included to travel shows that the medical team assumes the all-clear as a mere formality. The simple fact is Messi wouldn't have traveled if he wasn't going to play, and if he is going to play, then better he starts!